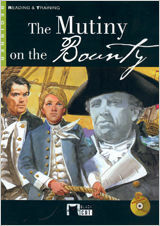 El autor de The Mutiny on the Bounty. Book + CD, con isbn 978-84-316-8030-5, es Cideb Editrice, esta publicación tiene noventa y seis páginas. Otros libros de Cideb Editrice son Great Mysteries Of Our World. Book + Cd, Le Tour Du Monde En 80 Jours+cd, Gulliver's Travels+cd N/e, American Folk Tales. Book + Cd, The Wonderful Wizard Of Oz. Book + Cd-rom, Twelfth Night. Material Auxiliar., Du Lait Au Fiel. Livre + Cd y Le Grand Meaulnes. Material Auxiliar. Educacion Secundaria. .